After a late and crazy Thanksgiving weekend I am looking for ways to slow down, simplify and reduce stress and anxiety. So this holiday season, whether you are tired of putting up elaborate Christmas decor, have time constraints or simply want to make life easier, here are 10 tips to decorate for the Christmas holidays with existing ornaments and gifts from nature! Hang your favorite ornaments around the house-from chandeliers, curtain rods, bulletin boards, around mirrors and off of art. Fill containers and plates, glass or otherwise with ornaments, pinecones, cranberries, tangerines, pine branches, white lights…let your imagination run wild. Add scent to help create a magical holiday feel- stove top with bubbling citrus, cinnamon and cloves; fill bowls with citrus and cloves; bake Christmas cookies; create Xmas sachets by filling socks (use the feet) with pine needles and sew closed (put in corners and drawers etc.). Put up your Christmas tree lights around door frames, mirrors, mantles and save the time involved with the whole hassle and expense of a Christmas tree. Use all your candles- create tablescapes by mixing in greens, berries, pinecones, ornaments, and silver and gold. After all, what we love about holiday decor is the glow and the sparkle, right? Use your new or old Christmas cards as ornaments on branches, taped on walls as art, artfully arranged on shelves and mantles. Make your own ornaments with paper, photos, and your imagination! And, of course you can always string popcorn and cranberries; hang pinecones with ribbon etc. Use letters from blocks, cards, scrabble games etc to spell out messages that are meaningful to you, and place around the house-ie; joy, peace on earth, love to all, Silence is golden etc…After all, it’s great to remember what this season is really all about! Take a walk in nature with your family and bring home dead branches, pine branches, berry branches, pine cones, nuts etc. to decorate throughout your home. Ask tree lots around your neighborhood for free greens. Most of them are too happy to give them away. Use these in vases, center pieces, pushed through your strings of lights that are draped around your mirrors, mantles and door frames. Add the pinecones, berries or existing ornaments and you get the scent, the look and feel of Christmas easy peezy! Check out the video below for visuals of these ideas and more. Happy Holidays…and remember, slow down and enjoy them! 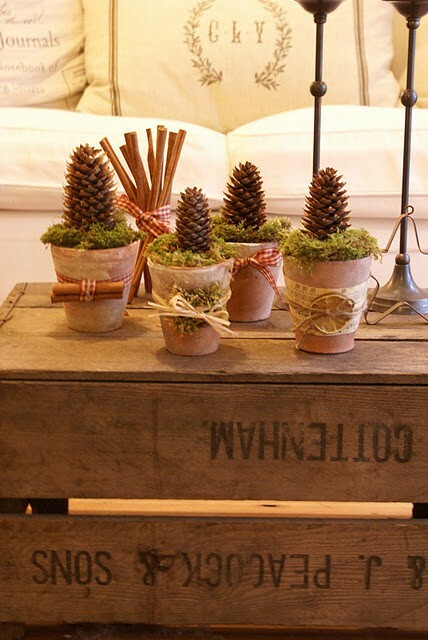 Love the picture with the little life trees and pine cones. It inspires me to take a walk with my daughter this afternoon to collect cones. Merry Christmas. Great ideas, and a wonderful way to re-invent the holiday spirit. Thanks for inspiring us, again! Thanks for your lovely words Beryn, Happy Holiday’s to you and yours! Just love this!!! Thank you for sharing. I want to use alot of these ideas!!! It’s my favorite time of the year!!! Some of those are very clever indeed! Thanks for sharing them, Irene. I am going to show my 2 kids this blog post tonight. I know they will be super inspired and creative. All I need to figure out between now and then is where I can find a local pine tree to go scavenge under! Really looking forward to my house smelling all pine scented. Thanks! So beautiful, Irene! and inspirational…I will share this with my sisters and daughter who all love to decorate for Christmas and are so creative, always looking for new ideas! your video is lovely! Great tips and ideas and I can adapt some of them for Chanukah too. I love your photos, Irene. You really are a wonderful photographer! Absolutely Susan. The silver tree branch with candles is actually a menorah. And, natures beauty and bounty are appropriate to celebrate love anywhere, are they not? Thank you Irene for your creative video. It reminded me how much I USED TO get really into the Christmas spirit and want to decorate, play, shop, bake, just everything festive. Over the years I’ve just focused on work so much and feeling I’m doing it alone (B/C I am) I just kind of gave up. Your video has inspired me to do a couple of things to express that festiveness again this year! Creating beauty for others, or simply for yourself is always uplifting. The scent of pine also uplifts your brain…good for business…so go for it! Beautiful video! Although I don’t participate in the holidays, I really enjoyed your use of branches, leaves, fruit, cones, and candles. It was lovely how you brought “nature” into your home. You created some stunning table displays too. I absolutely LOVE how you use ornaments in places other than the tree! Such simple, beautiful designs. And the smell of fresh greens in the home is one of the best parts of this season. Thanks, Irene! What beautiful ideas! I love the icicle hanging from the branches, the use of ornament and of the old cards. Great ideas, thanks Irene. To me the message was the message! All the decorations were just decorations for that message. After the kids left and since my husband is a bah humbug type person, I’ve not got into decorating much for the holiday. But looking at your picture I realize I need to do it for me- the heck with everyone else! Thanks for your beauty. Thanks Irene! You’ve blown some life and fragrance into the idea of putting at least a little Xmas decor up. Well, maybe a little more. These are such great ideas – and I love how you have put pictures with several of them. I am so NOT creative that I really need that visual representation. We don’t plan to do any decorating this year as we will be traveling for nearly a month, but these ideas are ones that I might try anyway. Many of them will be perfect all winter! Thanks, Irene. Wonderful tips to keep things simple and beautiful, and each suggestion generates several more. Happy holidays! I love bringing nature inside, recycling, slowing down, taking walks. And your photos are inspiring! Happy Holidays to you. Thank you for such beautiful ideas, Irene. Have always loved decorating from nature and loved the branch with the icicles reflecting the lights and the candle glow. My grandkids love to turn out ALL the lights and just leave that lit. Love keeping the holidays simple and abundant. A great reminder of what matters. Happy Holidays to you and yours dear Irene. Happy, Happy, Happy Holiday’s to you Jen! Wishing you all the best in the New Year, and hope to get together then!!!! go for a paid option? There are so many choices out there that I’m totally confused .. Any tips? Many thanks!